Environmentally friendly fundraisers are an excellent way to give to a worthwhile cause and enhance the local environment. Environmentally friendly or ‘green’ fundraisers can also involve local businesses that wish to give something back to the community. What is an Environmentally Friendly Fundraiser? Environmentally friendly fundraisers are sometimes known as ‘green’ or ‘eco’ fundraisers. Environmentally friendly fundraisers can be used to raise funds for a particular eco cause or to benefit the local community. This type of fundraising is also a way to educate others on the present and future benefits of becoming environmentally aware. Recycling, environmental clean-ups, planting trees and selling environmentally friendly products can all be included in an eco fundraiser. Local environment clean-ups are an excellent way to enhance the local community. Beaches, parks and local beauty spots can often lie neglected. Fundraisers can clean and improve these areas and raise sponsorship money. Local environment clean-ups can often attract publicity from the local press, which can lead to additional volunteers and donations. Environmental clean-ups can be a one off event day or can be part of a long running eco-fundraising campaign. It may be a good idea to contact local authorities who can advise and help when organising this type of fundraiser. There are many large and small businesses that will sponsor an environmentally friendly fundraiser. Fundraisers should think along the lines of large supermarkets that stock environmentally friendly products and health stores, garden centres and DIY stores. Local financial institutions such as banks are also well worth approaching for sponsorship especially if publicity can be guaranteed. Financial donations can be obtained from these businesses as well as donations in the form of products that can be sold at fundraising events. Businesses will usually require that their name is mentioned during a fundraiser. Getting schools involved in environmentally friendly fundraisers is a great way to educate children on the benefits of becoming environmentally aware. 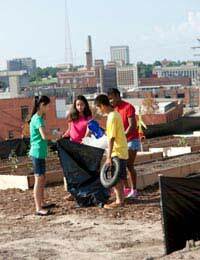 Children who become interested and active in environmental campaigns can become passionate about this subject. They will often try to get parents involved and this can be a great family activity. Children can also become involved and make a big difference to events such as environment clean up campaigns. Having schools, religious organisations, local scouts and guides involved should guarantee a large turnout at any fundraising event. Many fundraisers will raise funds for certain eco-friendly causes but there is nothing to stop the funds raised benefiting the local community. Fundraising donations can go towards enhancing local parks and beaches, which will be of benefit to all in the community. This type of fundraising cause can generate additional interest from both the press and local business sponsors. Large financial sponsors can be rewarded by having trees planted in their name or benches placed in parks with the sponsor’s name engraved. Businesses such as banks often have their own fundraising divisions and can provide advice and help on the matter. Fundraisers should consider obtaining advice from local eco-campaigners when considering this type of fundraising activity. Campaigners will usually already be fully aware of the best ways to raise funds for a range of eco-causes. An environmentally friendly fundraiser will be of benefit long into the future especially if it helps people to become more aware of green issues. With environment problems such as global warming in the media on a daily basis there has never been a better time to run an environmentally friendly fundraiser.